2 bedrooms, 1 full bathroom, 2 half bathrooms, sleeps 7. Fully air conditioned. Don't settle for a traditional beach apartment! Stay in this modern, three story townhouse available by the day/week/month. Fully furnished, with two reserved parking spaces. Sleeps 7. First Floor is an open great room that contains a full kitchen, dining area and living space with stereo with iPod dock, TV (100+ DirecTV channels available for additional charge) and DVD. A half bathroom and access to a private patio are also provided in this level. This great room now available with air conditioner(*). Second floor contains the two air-conditioned bedroom accommodations. The Master bedroom has a queen-size bed and a double size sofa-bed futon. The Second bedroom has a double / single bunkbed (Sleeps 3). This floor has a full bathroom with shower and a walk-in closet. The third floor is a breezy open terrace with a bar and fresh ocean views. At daytime you can see the Caribbean Sea, at night, the Lighthouse's beacon! *Great Room A/C subject to unit availability. Please ask. Camino del Mar: The townhouse is located in Camino del Mar in Combate Beach. It is a 21-unit private development where all units share a swimming pool and a gazebo. The complex is gated, with access to two cars per unit. It is a quiet neighborhood and only a six minute walk to the beach! Security Deposit (normally $150) and a signed agreement required to reserve the unit. Full payment required prior to checking-in. DirecTV and Internet available for an additional charge (starting at $20 for 4 days, each service). Personal Checks, Cash and Credit Cards accepted (ask for restrictions). Visit our internet site to see more pictures and info. We are a family of five, and love to enjoy Puerto Rico's outdoors. The Island's western coasts are our favorites, being the Caribbean Sea the most tranquil and family-oriented. Our family has been involved with this property for more that 25 years. The place started as a small cabin resort and later in the 2000's it was demolished and Camino del Mar was developed. We were involved with everything; from the design of the buildings to the marketing and sales of the units. 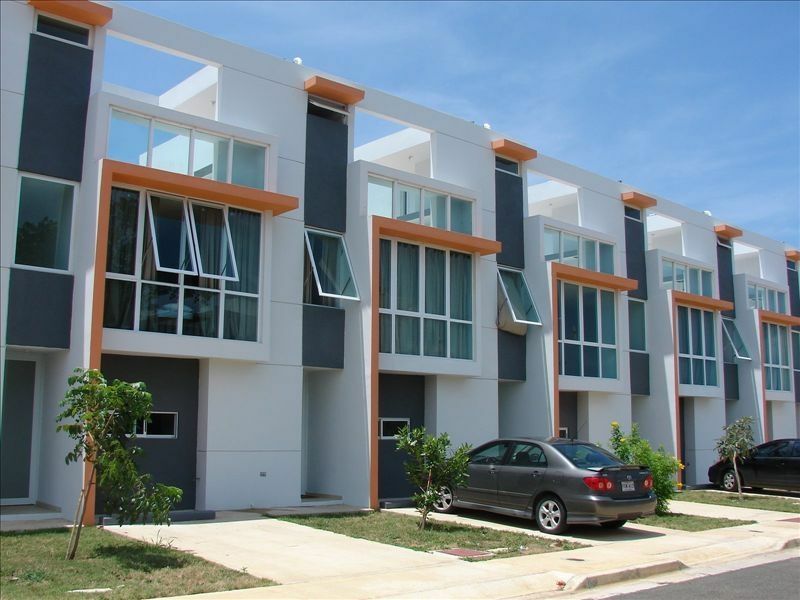 The modern looks and the 'non-apartment' setting are not found elsewhere in the Boqueron-Combate area. Sharing the pool with only 20 other neighbors is a plus. Apart from local holidays, the place is very, very quiet. The various Combate beaches are walking distance from the townhouse. Enjoy views of the Cabo Rojo Lighthouse from your third floor terrace. Both bedrooms have air conditioning. The living area A/C may be available, please ask before signing the agreement. Washer and dryer may be available, please ask before signing the agreement. Wi-fi internet (via 3G connection) is available upon request. Full kitchen with fridge, stove, oven, microwave, coffemaker, pots and pans. If you need special appliances please inquire for availability prior your check-in. DirecTV available upon prior reservation. Shared with the other 20 townhomes in Camino del Mar. Walk to the Beach! It is a six minute walk. Sightseeing icons include the lighthouse, the bio-luminiscent Parguera bay, the Mayaguez Zoo and the Guanica Dry Forest...all less than 30 minutes! Internet (wireless broadband) available (extra charge) on a first come, first served basis. Housekeeping available at an additional charge with previous reservation. Beach chairs and towels available; ask at time of reservation. Huge third-floor terrace with wet bar and patio furniture, great for BBQ-ing. A shared gazebo adjoins the swimming pool. There is also an open, private backyard adjoining the living room. Stainless Steel refrigerator, stove with oven, and microwave. Includes coffee maker. DirecTV available as an optional amenity starting at $20 for four days. All recreational facilities are shared with a small cluster of 20 neighboring villas. Parking for RV/Boat/Trailer: Available if requested at time of reservation. This apartment was extremely clean although beds were a little bit uncomfortable. My parents went here for Spring break and had a wonderful time, the only thing is that we consider that having a quality rest is important for vacations even more when you come with a sun kissed skin after a long beach day. Besides this I highly recommend this property. Thank you for your review! We are always looking for feedback and yours is truly appreciated. We will definitely check our bedding and make adjustments to improve its comfort. We agree that complete vacations should include perfect sleep! Cheers! The best location in the Combate area. close to restaurants, bakery, supermarket, gas station etc... I will recommended without hesitation. We rented for two weeks, and the apartments was a perfect fit for our needs. Very well maintained and clean. Kitchen is full equipment. We loved the third floor terrace were during the night you can have dinner with the stars. Mrs. Carmen and Mrs. Miladys was always available for anything that we need. We can't wait to visit Puerto Rico again and of course stay at Camino del Mar. Great location. Apt utilities are better that shown on the photos. Easy access and very friendly owner. The place was better than described; the beach very close by with a restaurant/bar with karaoke nights were the locals sing with quality voices. I recommend this place without hesitation. Planning to go back pretty soon. Very clean and well maintained property plus Ms. Carmen and Janeth, her daughter helped us whenever was necessary; very nice people. Loved renting this place for our vacation. We had a great stay in this lovely location. The picture does not do it justice! It is airy, spacious, quiet, serene and a two minute drive to Combate Beach. Three floors, very spacious rooms and bedrooms. The third floor has ample space to do a bbq and invite your guests! The pool was great for morning/late afternoon swimming with our son. The property is well kept. One thing to note is to read the fine print. The full advertisement says Fully Air Conditioned Home which you may think includes the living room, however, if you read the fine print it says please ask. If you do not inquire about the A/C unit in the living room or the washer and dryer unit you will not get the apartment shown (advertised) you will get an almost exact replica, with similar furniture, style, but without those features. Since we did not inquire, we did not get the apartment shown, we got a just as beautiful replica on apartment 12 without the living room air conditioning unit or the washer and dryer. It was not a deal breaker, the property has many trees, ample space- the weather was breezy and beautiful with the opened doors and fresh air. Note: If you have small children unit 12 does not have screens, use a mosquito repellent or get the unit advertised with full A/C. I'm sure you'll enjoy your stay, it is a safe environment. You're minutes away driving distance from the supermarket, restaurants and other beautiful beaches on the west coast of the island. Explore, Relax, have fun. Thank you very much to the owners, we thoroughly enjoyed our stay! Thank you for your positive and detailed review! the owner was very fast and helpful with all communication - by email and text. we flew in SJU, and she met us there. since we weren't going to back to SJU after our stay at her rental, she told us a very clever way to leave behind the keys and gate opener. the area the rental is located in is very quiet and secluded; it's also on a gated property - at the time there were very few other people around. there is also a small shared pool, which we didn't use - we weren't sure if we were allowed to even though no one would probably would have known if we did. the rental itself is very large for just two people. we arrived on a sunday, and the bar behind the property was blasting music, which ended around 11 pm so not too late. this was obviously just a weekend thing. we decided to sleep in the front smaller bedroom instead of the master bedroom, which has a large walk-in closet. the whole place is nicely appointed with air conditioning. the wifi was spotty but worked. we paid the nominal extra fee for cable, which was pretty limited. the tv itself isn't great, but ultimately this was negligible. the main bathroom has some water damage from the shower spraying behind the curtain, but you can affix the curtain so it doesn't. we decided to visit this corner for puerto rico for playa sucia, which was as beautiful as i hoped. it was maybe just a 10 minute drive at the most. we would definitely stay here again. Explore the other side of Puerto Rico. Its unique beaches and tranquility will make a stay in Cabo Rojo a memorable one. Make our property the 'basecamp' of your explorations. Easily drive to destinations like Parguera, Boqueron, Old San German (older than 'Old San Juan'! ), Mayaguez Zoo, Guanica Dry Forest, Yauco's coffee plantations, and much more. Another place of interest is the sea salt flats; it's a worthy hike! After your trip to the collection flats, take a break in the adjacent beach, part of the Combate natural reserve. Inquire us about more tourist information. Golf: You can find golf nearby at the Club Deportivo del Oeste, also located in Cabo Rojo. For serious golfing, head to Ponce (an hour drive East) to the Ponce Hilton, or try the most striking course in Puerto Rico at Royal Isabela (an hour drive West, invitation needed). Long weekends (with a holiday on Friday of Monday) have a three-night minimum stay requirement.